This photo was the one that convinced me is was time to buy a gadget for calibrating my monitors. If you are a digital photographer, designer, or artist and want to see consistent results in your work, monitor calibration is a necessity. If you've ever printed a photo and it turned out looking nothing like what you saw on your computer screen, you are probably way past overdue for a monitor calibration. I do my monitors every two weeks and see the difference immediately. 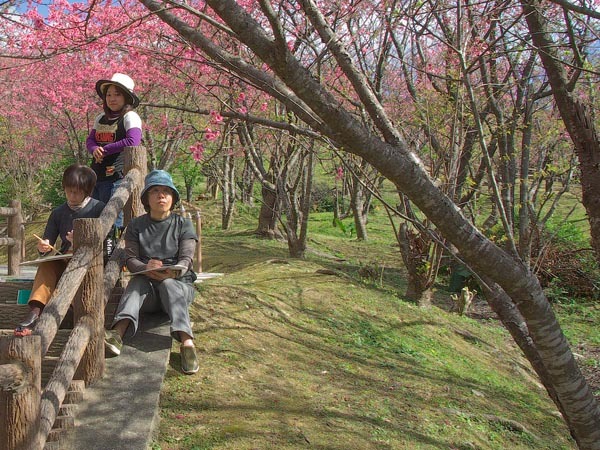 The photo above was taken during Cherryblossom Season (Feb 2009) in the northern hills of Okinawa, Japan. The gal standing was an Art Sensei (Teacher) and she had her class doing some sketches. I was on an assignment for a print magazine and needed their consent to use their photos for publication. So, in exchange for their signature on a model release, I promise to give them a printed copy of a photo. They agreed. I shot a series of photos. In fact, I think I may have shot this one before even asking them. That's the way I operate, sometimes, to get natural-looking photos. Well, I got home, downloaded the camera and reviewed my shots for the day. I wasn't too happy with the results. I selected three or four photos out of the series with the art class in them and decided to just print them on regular letter paper. Then, if the Art Sensei liked one better than the others, I'd go back and print her a nice, big glossy on A4 sized paper. This photo came out of my printer and I couldn't believe my eyes. It didn't look anything at all like what I was seeing on my monitor. If I hadn't promised the Sensei a copy of a picture, I would have deleted the whole lot of them. Something was horribly out-of-whack. It was my monitor calibration. I got online and ordered a gadget to calibrate my monitors the next day. Now, when I tweak colors or contrast on a photo before printing, what I see is what I get. DO YOU EVER CALIBRATE YOUR COMPUTER'S MONITOR ? YOU SHOULD ! The Spyder2Express is what I bought. Hang-on and I'll post a review for you later this week. Yup, if you're posting photos on your blog regularly, like I do, calibration is highly recommended. You'll see a big difference, right away, if you haven't calibrated your monitor before !